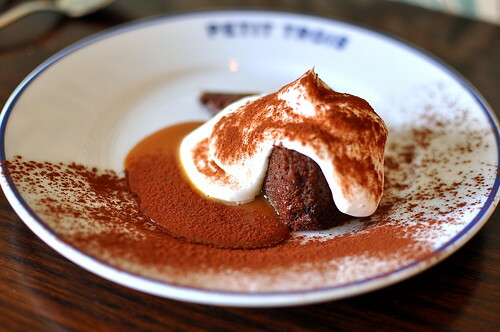 Following the tremendous success of Trois Mec, Chef Ludo Lefevre, along with partners Vinny Dotolo and Jon Shook of Animal and Son of a Gun, opened Petit Trois directly next door. 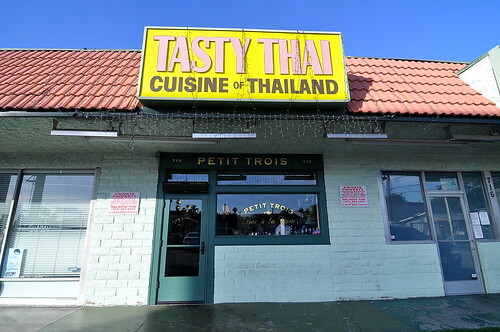 Whereas Trois Mec is quite formal, requiring pre-paid reservations and featuring pre-fixe menus, its sister restaurant takes the opposite approach. 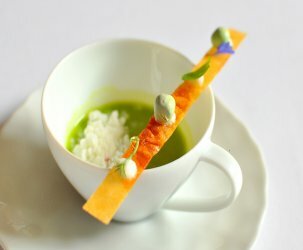 Both, it must be noted, are truly fantastic places to dine. 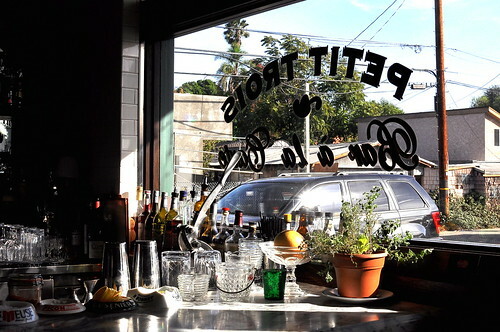 The Astronomer and I made our way to Petit Trois for a late lunch on a Sunday afternoon. While all the seats along the kitchen-facing counter were taken at half past two, the ones along the opposite wall were free for the taking. 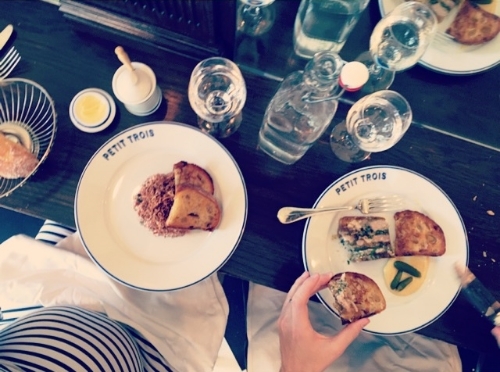 We grabbed two stools and settled in for a feast of French bistro classics. 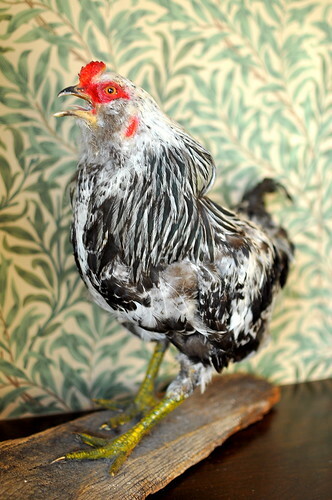 Seated beside us was a stuffed rooster. 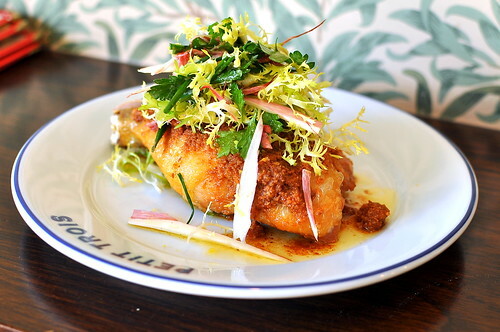 The chef’s got a thing for le coq. 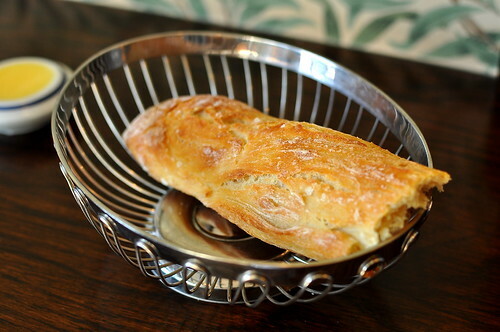 To start: a hunk of baguette made by Zack Hall of Clark Street Bread, along with a crock of deep yellow butter. Though we found the bread a touch under-salted, its dense interior and crusty exterior more than made up for it, as did the properly salted butter. The Astronomer and I ordered three small plates and one main course to share. 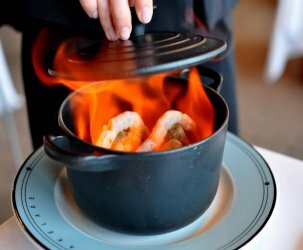 Our waiter and the kitchen staff were thoughtful enough to course out the offerings, bringing two dishes at a time to the table. 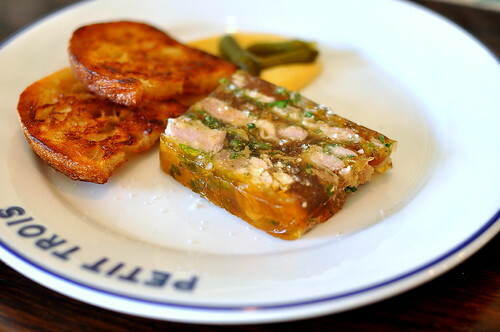 The first set of dishes included the jambon persillé ($10), a gorgeous ham and parsley terrine served with toasted and buttered bread, cornichons, and sinus-clearing mustard. 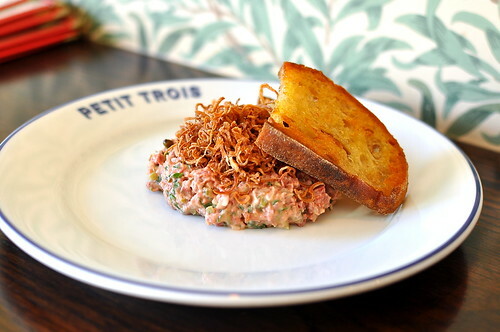 Served in the tandem with the terrine was the steak tartare ($19). 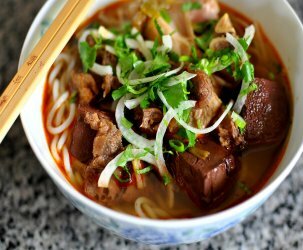 The seasoning on the coarsely chopped beef was perfectly balanced, while the tangle of fried shallots atop surprised me with its restraint. The fried shallots served in Vietnamese dishes can be very assertive, but the ones here were pleasantly delicate somehow. The next duo of dishes included an otherworldly chicken leg ($24) crusted with “brioche butter” and balanced with vinaigrette-dressed greens. Longtime Gastronomy readers know that I tend to shy away from ordering chicken, but under Ludo’s care, this bird sang the most beautiful song—crispy, buttery skin coupled with the juiciest meat ever. The final savory dish was the Burgundy escargots ($18). 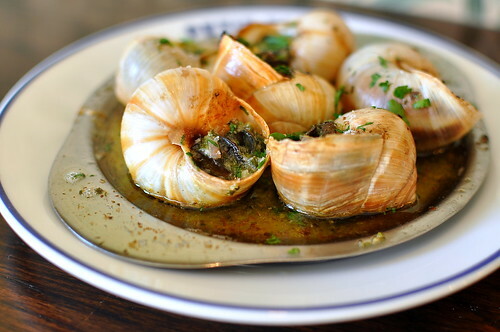 It’s impossible to go wrong with butter-soaked and garlic-kissed snails. More bread, please. To finish, we shared a slice of delightful chocolate cake ($10) prettied with caramel, whipped cream, and a generous dusting of cocoa powder. It really hit the spot. I’ll forever remember our lazy Sunday lunch here as the final outing before our longtime party of two became a party of three. Baby Girl made her debut less than 24 hours later…there must’ve been something in the butter. OMG! Congratulations!!!!!!!!!!!!!!! (Way to sneak that in at the end of the post, ha!) Welcome baby girl!!!!!! So happy for your family!!!! Congratulations baby girl!!!!!!!! Everything your mommy did in life you will do to her!!!! Aw, Cathy! Congrats on your new addition! So happy for you guys! I enjoy your site. Hope you’ll be able to continue, albeit slightly less often. Aw, congratulations!! She looks precious (Flickr pic)!